The Amerex COBRA Restaurant Fire Suppression System combines the “Zone Defense” and “Appliance Specific” systems to provide appliance-specific coverage with total flooding zone protection making it easy to move or add appliances. The system has sleek stainless steel throughout the system and metal-only nozzles that are tucked neatly under the hood 60″ above cooking surfaces. COBRA has full electronic actuation—the NEW STRIKE™ Electronic Control System (ECS) that can monitor two separate hood systems; can be tied into auxiliary controls such as a building’s alarm system; and can be placed within 100′ of the agent tank for maximum flexibility. The Amerex “Zone Defense” ZD (Zone Defense) Restaurant Fire Suppression System adds greater flexibility by allowing reconfiguration of a kitchen or moving appliances without moving nozzles. Due to its adaptability, this system is the most cost effective choice over the life of the system. The ZD system was designed with fine dining, culinary schools, military facilities, hotels and hospitals in mind. 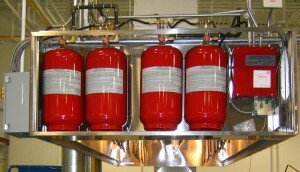 The Amerex “Appliance Specific” KP (Kitchen Protection) Restaurant Fire Suppression System provides appliance-specific coverage that typically offers lower initial cost. The KP system is ideal for uses where appliance location is fixed such as in fast food chains, casual dining, cruise ships and school cafeterias.